Real engineering optimisation problems are often subject to parameters whose values are uncertain or have noisy objective functions. Techniques such as adding small amounts of noise in order to identify robust solutions are also used. The process used in evolutionary algorithms to decide which solutions are better than others do not account for these uncertainties and rely on the inherent robustness of the evolutionary approach in order to find solutions. In this paper, the ranking process needed to provide probabilities of selection is re-formulated to begin to account for the uncertainties and noise present in the system being optimised. Both single and multi-objective systems are considered for rank-based evolutionary algorithms. The technique is shown to be effective in reducing the disturbances to the evolutionary algorithm caused by noise in the objective function, and provides a simple mathematical basis for describing the ranking and selection process of multi-objective and uncertain data. Carlos A. Coello Coello. 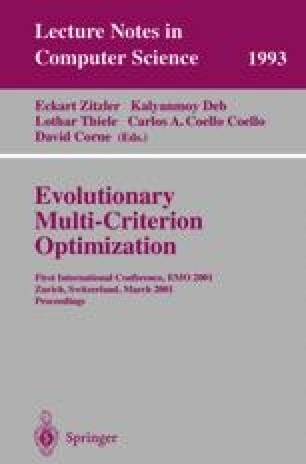 List of references on evolutionary multiobjective optimization. http://www.lania.mx/ ~ ccoello/EMOO/EMOObib.html. Last accessed 3 July 2000.